BUSH HONORS FAVELA: President Bush met with Barbara Favela, center, widow of Honolulu police officer Steve Favela, yesterday on Capitol Hill in Washington, D.C., during the annual Police Officers' Memorial Ceremony. 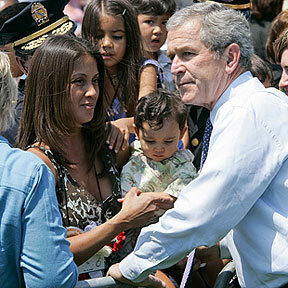 Officer Favela was killed when his motorcycle crashed while escorting Bush's motorcade in November. Associated Press photo.